Nathanael Taylor, 10, a student at Milton Elementary School, was named the winner of the Beebe Healthcare 100th Anniversary Children’s Book Artwork Contest. 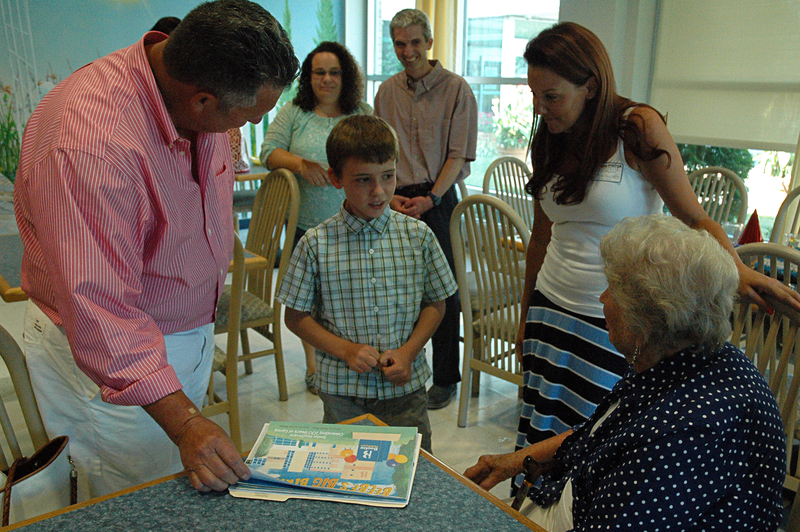 Nathanael was honored during a birthday celebration at Beebe Healthcare’s Medical Center in Lewes. During the celebration, Nathanael’s parents Tamara and Craig, shared the story of a time they spent more than 26 days at Beebe. After a family hiking trip, Craig felt weak and could barely walk from the bedroom to the bathroom, so Tamara called a friend to watch their three children and rushed Craig to Beebe’s Emergency Department. Tests were run and Craig’s condition worsened. Finally surgery was performed on what doctors discovered was a ruptured bowel. It was fitting to celebrate Nathanael’s 100th anniversary artwork, which showcased what the hospital will look in the future, in the Sunshine Café. 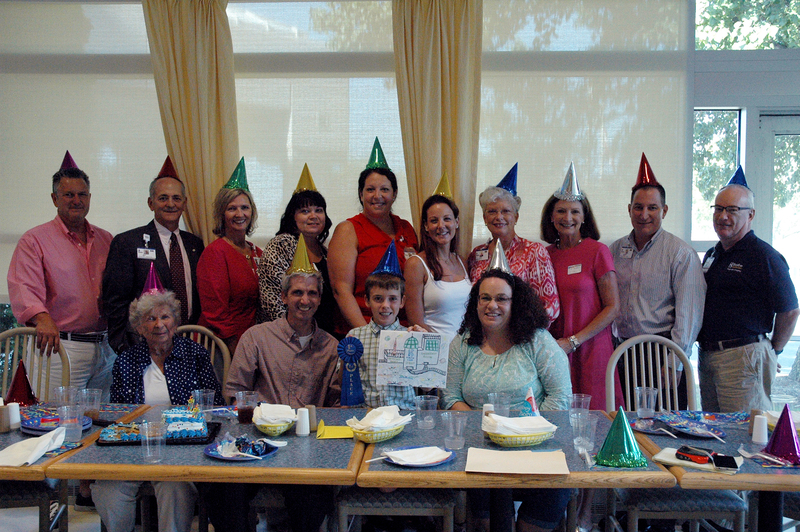 Members of the 100th Anniversary Committee wore party hats and presented Nathanael with gift certificates so he can come eat at the Sunshine Café any time he likes. The artwork contest was open to third-, fourth-, and fifth-graders. Nathanael’s piece, which featured two emergency departments and landing sites for ambulances and rockets, will be published on the inside of Beebe’s 100th Anniversary children’s book. For more information on Beebe’s 100th Anniversary, go to www.beebehce.org. 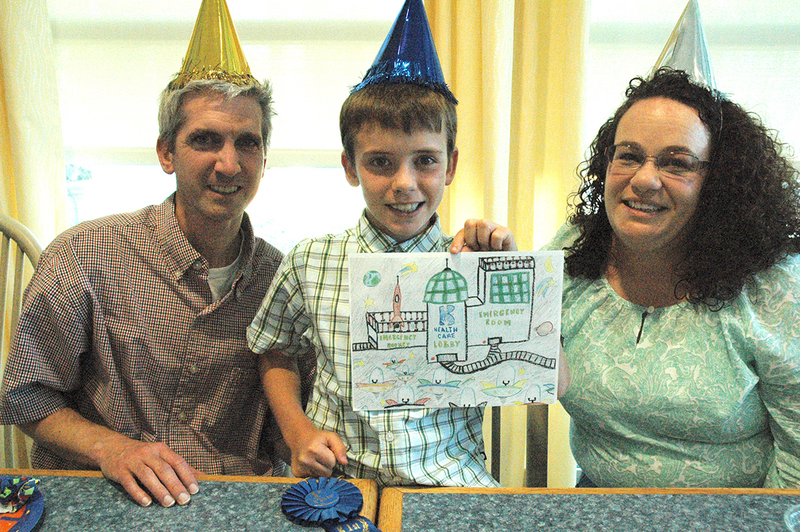 Captions: Taylor family: Shown are Craig, Nathanael, and Tamara Taylor with Nathanael’s winning artwork and blue ribbon. Group1: Beebe Healthcare team members, members of the 100th Anniversary Committee, and members of the Beebe family, gathered to celebrate Nathanael Taylor and his family. Nathanael’s artwork was selected to be printed on the inside back cover of Beebe’s 100th Anniversary children’s book, set be be launched in Spring 2016. Shown (in back) are Alex Moore, Beebe family member, Jeffrey M. Fried, , President and CEO, Beebe Healthcare; Jean Winstead, Health Librarian and co-chair of the 100th Anniversary History Committee; Lynn Wilkins, Executive Assistant and co-chair of the 100th Anniversary History Committee; Leanne Prosser, 100th Anniversary Coordinator; Alison Lerner Myers, member of the Cape Henlopen School Board and chair of the 100th Anniversary children’s book; Jan McCarty, co-chair of the 100th Anniversary and Beebe Board Member; Christine Moore, co-chair of the 100th Anniversary; Frank Molino, Manager of Security and co-chair of the 100th Anniversary Education Committee; and Dan Mapes, Director of Diagnostic Imaging Services and co-chair of the 100th Anniversary Education Committee. In front are Anna Beebe Moore, Beebe family member, and Craig, Nathanael, and Tamara Taylor. Nathanael with Anna Beebe Moore: Nathanael Taylor, center, gets a look at Beebe’s 100th Anniversary children’s book pages with (left to right) Alex Moore, Alison Lerner Myers, and Anna Beebe Moore, as Nathanael’s parents, Tamara and Craig, watch.